We know that online shopping for wedding stationery can be a bit difficult when you’d like to get a feel for a product by seeing and holding it before placing an order. As we want to make sure you feel fantastic about your purchase, we are happy to send you samples of our cards! Our samples packs allow you to see our high-quality paper/card and printing up close and to get an idea of how your personalised invitations and cards will come out. It will also include a sample of our various size invites. 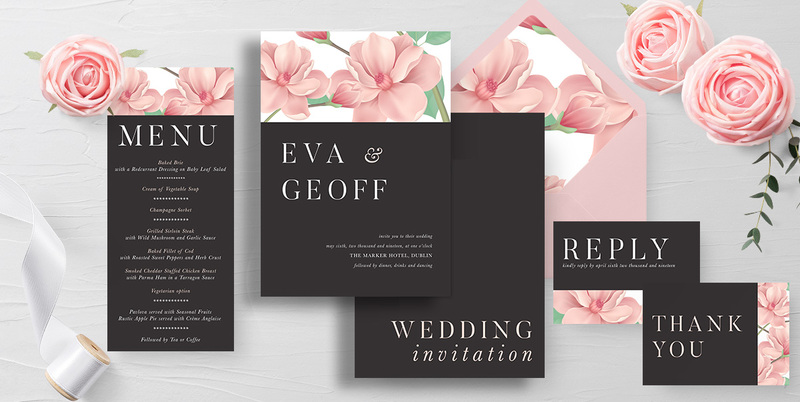 If you have a particular design in mind, don’t hesitate to give us a call and we can have a chat to discuss your wedding invitation idea. Our sample packs include a variety of items, including invitations, save the dates, RSVPs, information cards, belly bands, envelope liners and much more. Please fill out the below form and pay €5 for postage and packaging. We will send you some beautiful samples within a week. We love showing off our invitations and we’d love you to see them too! We would love the opportunity to sit down with you and discuss your ideas.